To set up a hot spare for Icewarp Mail Server you can follow the steps below. This would require both servers to be licensed if you want instant fail over. The other option is to activate the license online for the secondary server after the primary server goes down. This would cause a little downtime in between the registering of the secondary server and the crashing of the primary. You would need a central file storage server so both servers are sharing the same data and mail boxes. With it set up in this manner the primary server can go down and the secondary server will then step up and take the load until the primary server is back online. This will not cause any issues with users as you will be seeing the same mail boxes and data since you are on a central storage path. You would need to store all the users in a database so both servers connect to this database for the information. The below steps will walk you through the setup. Install Icewarp on the secondary server and set up a MX2 record for this server. Install a database and connect the primary to this database and convert the users/domains into the DB. 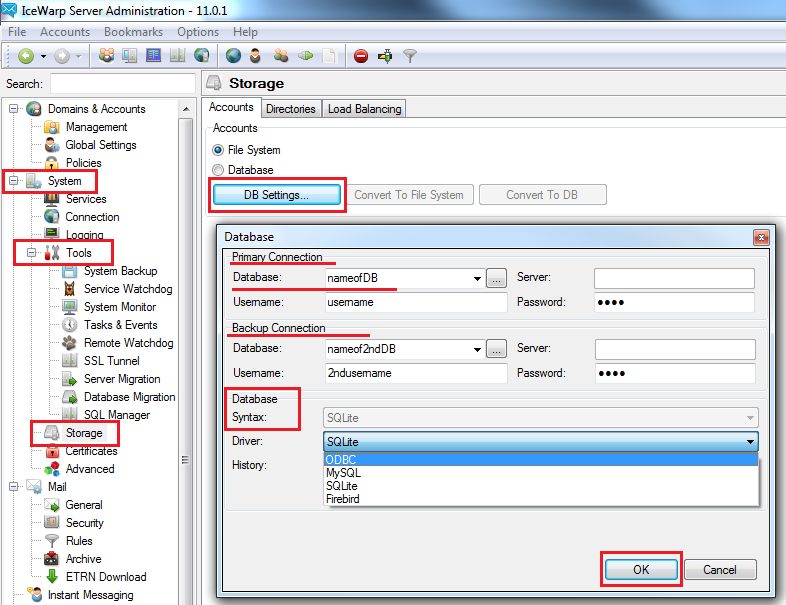 You first need to create a Windows ODBC connection (Administrator Tools, ODBC settings) to the new DB and then convert the users. To do this you go to the [Storage] tab in the console and click on [Database, DB settings] and then choose [Convert to ODBC]. This will take the system users and domains and import them into the DB. You then point the secondary server to this DB. The next step is to copy the mail to this central file storage server so both servers can pull from it. You also will want to pull the spam, config, and calendar (If you use contacts and calendars) folders to the share as well. You have to ensure both servers have read/write access to the new storage path. You would set the share path for the folders under the [Storage, Load Balancing] tab. You can set one server up with this information pointing to the file server and database and then apply the back up file to the secondary server instead of going through each step again. Once all folders are moved, paths set to the folders, you then need to make sure at least the mail storage path is pointing to the share, the logs and temp folder can stay on the actual server. Now you can start the services back up and you will have a hot spare or if you have load balancing hardware/software you can have these two servers setup for that as well.